15-round (standard) or 17-round detachable box magazine. 10, 15, 17, 18, 20, and 30 round magazines are available. The Beretta M9—officially the Pistol, Semiautomatic, 9mm, M9—is the designation for the Beretta 92FS semi-automatic pistol by the United States Armed Forces. The M9 was adopted by the United States military as their service pistol in 1985. The M9 won a competition in the 1980s to replace the M1911A1 as the primary sidearm of the U.S. military, beating many other contenders, and only narrowly defeating the SIG P226 for cost reasons. It officially entered service in 1990. Some other models have been adopted to a lesser extent, namely the M11 pistol, and other models remain in use in certain niches. The M9 was scheduled to be replaced under a United States Army program, the Future Handgun System (FHS), which was merged with the SOF Combat Pistol program to create the Joint Combat Pistol (JCP). The JCP was renamed Combat Pistol (CP), and the number of pistols to be bought was drastically cut back. The U.S. Army and Air Force are seeking to replace their M9s through the Modular Handgun System program, which has chosen the SIG Sauer P320. In the 1970s every branch of the U.S. Armed Forces except the U.S. Air Force carried the .45 ACP M1911 pistol. USAF opted to use .38 special revolvers, which were also carried by some criminal investigation/military police organizations, USAF strategic missile (ICBM) officer crews, and by military flight crewmembers across all the services when serving in combat zones or when engaged in nuclear weapons duties. The Department of Defense then decided to synchronize the weapons of all five branches of U.S. forces. The ground combat branches of the services found this decision highly contentious, but was meant to eliminate the need to buy replacements for worn out M1911 frames and to establish a common NATO pistol round to simplify logistics in case of war with the Soviet Union in Europe. In 1979 the Joint Service Small Arms Program began searching for a replacement for the venerable M1911, and the 9×19mm Parabellum round was selected for compliance with the NATO Standardization Agreement (STANAG). In 1980, the Beretta 92S-1 design was chosen over entries from Colt, Smith & Wesson, Walther, the Star M28, and various Fabrique Nationale and Heckler & Koch models. The result, however, was challenged by the US Army, and new tests were done by the Army. In 1984, the trials started again with updated entries from Smith & Wesson, Beretta, SIG Sauer, Heckler & Koch, Walther, Steyr, and Fabrique Nationale. Beretta won this competition, but there was a new trial, the XM10 competition, in 1988. This resulted in two different trials that were more limited but resulted in the Beretta being chosen, albeit with an updated design. Concurrent to the pistol selection process, beginning in 1979 the Bianchi International holster company began its development of a multi-function military holster to be ready for the issuance of a new pistol. This holster – designed by John Bianchi and Richard Nichols – has served the U.S. Armed Forces well for decades designated the M12, was adopted simultaneously with the adoption of the Beretta 92F in 1985. The Beretta 92F survived exposure to temperatures from −40 to 140 °F (−40 to 60 °C), being soaked in salt water, being dropped repeatedly on concrete, and being buried in sand, mud and snow. Additionally, the 92F proved a MRBF (mean rounds before failure) of 35,000 rounds. That number is often touted as the equivalent to five or six times the pistol's service life. While this is normally true in European militaries, armed forces of the United States normally subject sidearms to much more extensive use. The Iraq War, which featured frequent urban and room-to-room combat, has required American soldiers to rely more heavily on their pistols. Design of all the parts to make them 100% interchangeable to simplify maintenance for large government organizations. Modified the front of the trigger guard so that one could use finger support for easier aiming. Recurved the forward base of the grip to aid aiming. Hard chromed the barrel bore to protect it from corrosion and to reduce wear. New surface coating on the slide called Bruniton, which allegedly provides better corrosion resistance than the previous plain blued finish. It also has an enlarged hammer pin that fits into a groove on the underside of the slide. The main purpose is to stop the slide from flying off the frame to the rear if it cracks. This was added after slide failures were observed in Beretta models with very high round counts during tests (failures later demeed to defective ammunitions used in tests). The M9 features multiple internal safeties, including a firing pin block that prevents the firing pin from moving without the trigger being pulled, and a firing pin striker that rotates when the safety lever is engaged preventing the firing pin from being hit even if the hammer falls. The M9 also has an ambidextrous external safety lever allowing both left and right handed users to engage or disengage the safety mechanism. The M9 was updated to the M9A1 in 2006. It added—among other things—a 1-slot Picatinny rail for the attachment of lights, lasers, and other accessories to the weapon. The M9A1 has more aggressive front and backstrap checkering and a beveled magazine well for easier reloading of the weapon. M9A1 pistols are sold with physical vapor deposition (PVD) coated magazines developed to better withstand the conditions in the sandy environments in the Iraq and Afghanistan wars. New production materials also make M9A3 production more cost efficient. The M9 22LR is a variant of the M9 in .22 Long Rifle and features the same operation, controls and takedown as the M9. The M9 22 is available with 10 and 15 round magazines, removable sights, and interchangeable grip panels which fit the Beretta M9. Prior to its widespread adoption by the U.S. military, questions were raised in a 1987 General Accounting Office report after an incident where a slide failure on a Beretta 92SB injured a Naval Special Warfare member, and two more failures were later observed in additional testing. 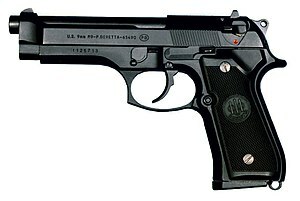 These failures included both military and civilian Beretta models with very high round counts, and after investigation they were deemed the result of ammunition supplied by the U.S. Army which exceeded the recommended pressures specified by NATO but nonetheless provoked a modification in the M9 design to prevent slide failure from causing injuries to the user. In December 2006, the Center for Naval Analyses released a report on U.S. small arms in combat. The CNA conducted surveys on 2,608 troops returning from combat in Iraq and Afghanistan over the past 12 months. Only troops who fired their weapons at enemy targets were allowed to participate. 161 troops were armed with M9 pistols, making up 6 percent of the survey. 58 percent of M9 users (93 troops) reported they were satisfied with the weapon, which was the lowest satisfaction rate in the survey. 48 percent of users (77 troops) were dissatisfied with the M9's ammunition. 64 percent (103 troops) were satisfied with handling qualities such as size and weight. M9 users had the lowest levels of satisfaction with weapon performance, including 76 percent (122 troops) with accuracy, 66 percent (106 troops) with range, and 88 percent (142 troops) with rate of fire. 48 percent of M9 users (77 troops) were dissatisfied with its ability to attach accessories. 26 percent of M9 users (42 troops) reported a stoppage, and 62 percent of those that experienced a stoppage said it had a small effect on their ability to clear the stoppage and re-engage their target. Only 45 percent of M9 users (72 troops) reported their weapon's magazine did not fail to feed completely. 83 percent (134 troops) did not need their pistols repaired while in theater. 46 percent (74 troops) were not confident in the M9's reliability, defined as level of soldier confidence their weapon will fire without malfunction, mainly due to difficulty of maintenance. 63 percent (101 troops) were confident in its durability, defined as level of soldier confidence their weapon will not break or need repair. The M9 had the lowest levels of soldier confidence in reliability and durability. 74 percent of M9 users offered recommendations for improvements. 26 percent of requests were for increased caliber or stopping power, with some specifically requesting returning to .45 ACP rounds. 20 percent of requests were for a new pistol. Other recommendations were for more durable magazines and better grips. In 2007, soldiers in the field had many of concerns with the M9, notably a lack of confidence in its stopping power resulting from the use of the 9mm ball round, a significant factor in military evaluations because the Hague Conventions (1899 and 1907) prohibit use of expanding bullets in warfare between contracting parties. The United States is not a signatory but generally observes the agreement. The U.S. military has been criticized for not purchasing magazines from Beretta. The military awarded a contract to Airtronic USA because the previous manufacturer, Check-Mate Industries, was charging too much per magazine, though Check-Mate magazines are still sometimes issued. Prior to Check-Mate magazines being purchased, the military purchased magazines from the Italian firm Mec-Gar. Airtronic has stated that its M9 magazines will be made similar to Mec-Gar's because of reliability problems with Check-Mate magazines. There were reported failures with the government-contracted 9mm magazines. After extensive testing and actual testimony given by the troops it was concluded that the failures were caused by the heavy phosphate finish called for in the government contract, combined with the unique environmental conditions in Iraq. After corrections to the government required specifications for the magazine finish, almost two million new magazines have been distributed without any further malfunctions. In the competition to find a new vendor, three finalists were chosen. These three were: Airtronic Services, Inc. classified as a "Moderate Risk", PHT Supply (partnered with Triple K Mfg.) also classified as a "Moderate Risk" and Check-Mate Industries, Inc. classified as a "Very Low Risk". Of the three, Airtronic Services, Inc was chosen by their low bid of $22,471,600. Airtronic Services delivered the first 900,000 magazines with zero failures while costing less than the previous supplier Check-Mate Industries. U.S. Marines train with the M9 on board USS Blue Ridge (LCC 19) in March 2005. The M9 has been the standard sidearm of the United States Navy, United States Army and the United States Air Force since 1985, replacing the Colt M1911A1 in the Army and Navy and the Smith & Wesson .38 Special in the Air Force. The M9A1 is also seeing limited issue to the United States Marine Corps. A large number of M9s and M9A1s were ordered in 2006. During the 2009 SHOT Show, Beretta announced it had received a US$220 million contract for the delivery of 450,000 M9s and M9A1s to the U.S. military, within five years. The Beretta M9 General Officer's Model is a special model issued to General Officers in the Army and Air Force  that replaced the special issue RIA M15 General Officer's Pistol and Colt M1911A1 beginning in 1986. It is identical to the standard M9 sidearm, with standard Bruniton-polymer finish and black composite grips, except it has a "GO"-prefix to its serial number range, starting with GO-001. It comes with a metal belt buckle that comes in gold metal for Army generals and silver metal for Air Force generals. The Marine Corps Times reported plans in July 2007 for all officers below the rank of Colonel and all SNCOs to be issued the M4 carbine instead of the M9. The new assignment policy will still assign M9s to Marine Colonels and above and Navy Petty Officer First Class and above. The United States Coast Guard has replaced most of its M9 pistols with the SIG P229 DAK, though some M9s remain in service with certain units. The M9 is issued to crewmembers on Military Sealift Command vessels. BerettaUSA announced on September 30, 2011 that the U.S. Army's Foreign Military Sales program has purchased an additional 15,778 Model 92FS pistols for the Afghan military and other U.S. allies. The Model 92FS is the non-U.S. military designation for the M9 pistol. In September 2012, Beretta USA announced that the U.S. Army had bought 100,000 M9 pistols and that the M9 "would remain their sidearm for the next five years." The U.S. Army and Air Force are seeking to replace their M9s through the Modular Handgun System program. The House Armed Services Committee wants to terminate the program in favor of upgrading the M9. Program officials say buying a new pistol is the better option due to advances in handgun designs, the difficulty in addressing all of the M9's issues, other pistols being less expensive to produce and maintain, and the low confidence soldiers have in the M9. A three-year engineering, manufacturing, and development (EMD) phase is to begin in early 2014. Commercial off-the-shelf pistols will be tested for capabilities such as accuracy, dispersion, compatibility, and corrosion resistance under extreme weather and extreme combat conditions. The pistol's service life is expected at 25,000 rounds. The M9 is required to fire 5,000 rounds, while data from Beretta shows the average reliability of the M9 pistol to be 17,500 rounds without a stoppage. In December 2014, Beretta unveiled its M9A3 pistol upgrade for a separate Army effort to identify Engineering Change Proposals (ECPs) under its existing contract. The company presented the upgrade to improve the M9's performance as a more cost-effective solution without needing to buy a different handgun. Improvements include a thin grip with a removable, modular wrap-around grip, MIL-STD-1913 accessory rail, removable front and rear tritium sights, extended and threaded barrel for suppressor use, 17-round sand resistant magazine, and other small features, all in an earth tone finish. Later that month, the Army decided not to evaluate the M9A3 in favor of pursuing the MHS program, maintaining that the M9 design does not meet requirements and a cost-benefit analysis determined the old fleet would cost more to replace and repair than buying a new service pistol. Beretta claims M9A3 upgrade features fix most of the complaints and could be sold for less than the cost of previous M9 versions. The Army formally rejected the M9A3 ECP proposal at the end of January 2015. On January 19, 2017, it was announced that a customized version of the SIG Sauer P320 had won the United States Army's XM17 Modular Handgun System competition. The full-sized model will be known as the M17 and the carry-sized model will be known as the M18. "Only the Sig Sauer P320, with a serialized core frame and the ability to swap different grip lengths and slide-barrel combinations, seems to meet the requirements of the RFP among the named designs," noted Bob Owens writing for BearingArms.com. ^ "PEO Soldier - Equipment Portfolio". Retrieved 25 December 2014. ^ Adler, Dennis (2010). John Bianchi, an American Legend. Minneapolis, WI 55425: Blue Book Publications Inc. pp. 64–79. ISBN 978-1-886768-88-8. ^ Ayoob, Massad (2005). Gun Digest Book of Beretta Pistols. Gun Digest. ^ Zidock, Alex (December 1993). "Armed Force – Subjected to Rigorous Testing and Combat in Desert Storm, the Beretta 92FS Passes Muster as the Official U.S. Military Sidearm". Popular Mechanics. Hearst Magazines. p. 40. ^ "92FS PISTOL". Beretta. Archived from the original on January 6, 2010. Retrieved 2010-03-06. ^ "Beretta Web – M9A1". Retrieved 2010-03-06. ^ Fred Mastison (2014-12-03). "The Beretta M9 Continues Its Impressive Battle Legacy". Tactical Life Gun Magazine: Gun News and Gun Reviews. ^ "Beretta's Answer - The Firearm Blog". The Firearm Blog. 2014-12-18. ^ "Beretta M9A3 Review - A First Look at Beretta's New M9 Pistol". luckygunner.com. ^ "5 reasons the Beretta M9A3 will be the next service pistol". Gun Nuts Media. ^ "M9_22LR". www.beretta.com. Retrieved 27 March 2018. ^ "Beretta M9 Rimfire Pistols : Cabela's". www.cabelas.com. Retrieved 27 March 2018. ^ "The True Story of the Beretta M9 Pistol". Retrieved 25 December 2014. ^ "Soldier Perspectives on Small Arms in Combat" (PDF). Archived from the original (PDF) on 2015-08-31. Retrieved 2013-07-25. ^ Dockery, Kevin (2007). In Future Weapons. Berkley Books. p. 175. ISBN 0-425-21750-7, ISBN 978-0-425-21750-4. Google Book Search. Retrieved on May 31, 2009. ^ a b c "Airtronic Takes Over Contract 14 million M9 Pistol Magazines, Offers Sand Solutions". Defense Industry Daily. 5 January 2006. Retrieved 25 December 2014. ^ Beretta provides pistol system to Marines. Retrieved on April 20, 2008. ^ "BERETTA U.S.A. CORP. WINS LARGEST U.S. MILITARY HANDGUN CONTRACT SINCE WORLD WAR II ALL PISTOLS TO BE BUILT BY U.S. WORKERS IN MARYLAND" . Retrieved on 1/15/2009 Archived copy at WebCite (June 3, 2009). ^ "The Military Memorial Museum". Retrieved 25 December 2014. ^ "USA TODAY: Latest World and US News - USATODAY.com". USA TODAY. Retrieved 27 March 2018. ^ "Marines.mil - The Official Homepage of the United States Marine Corps". Archived from the original on 29 November 2014. Retrieved 25 December 2014. ^ Capt. Kelly Sweeney (October–November 2008). "Mariners need to be able to defend themselves against pirates". Professional Mariner. Archived from the original on 2012-04-01. Retrieved 2011-10-26. ^ "U.S. Army Purchases Additional Beretta 9mm Pistols" Archived December 19, 2011, at the Wayback Machine, press release at berettausa.com, September 30, 2011. ^ "Beretta 90 series official page". Archived from the original on April 8, 2014. ^ "Army rejects Beretta's pitch for upgraded". Militarytimes.com. 11 February 2015. Archived from the original on 2015-02-12. Wikimedia Commons has media related to M9 pistol. GAO report, Pistol Procurement, Allegations on Army Selection of Beretta 9mm as DOD Standard Sidearm, June 1986.